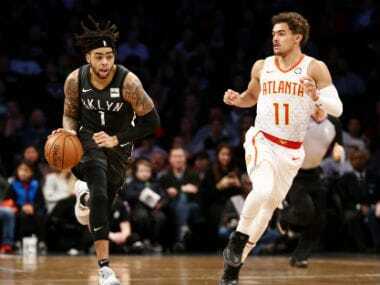 Los Angeles: D'Angelo Russell produced a double-double to lead the Brooklyn Nets to victory against his former club with a 115-110 win over LeBron James and the Los Angeles Lakers on Tuesday. 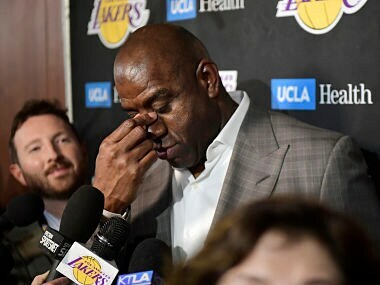 Russell was selected by the Lakers with the second overall pick in the 2015 draft, but was traded only two years later after an unhappy start to his NBA career. However, the 22-year-old point guard reminded the Lakers of his talents with a decisive contribution to lead the Nets to victory at Brooklyn's Barclays Center. Russell finished with 22 points, 13 assists and four rebounds as the Nets improved to 14-18 in the Eastern Conference standings. Russell was one of six Brooklyn players to finish in double digits as the home side completed a sixth straight victory. "You look at the scoreboard - it took the whole team to get it done tonight," Russell said afterwards. "Defensively we came in and did our job. I couldn't be more proud of our guys." Russell said the Nets were determined to extend their winning run. "One game at a time," Russell said. "We're not satisfied. We want to keep it going." Russell's points tally included a clutch three-pointer down the stretch which put the Nets six points clear with 22 seconds remaining. 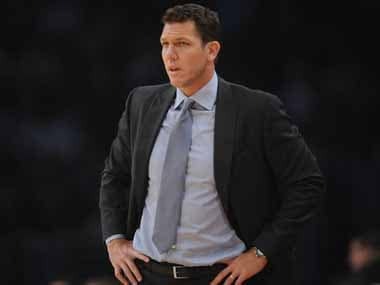 "He hurt us," Lakers head coach Luke Walton said of Russell. "He's a talented player and we know that. Give him credit. "He had a big time game tonight but that's why this team's won six in a row now – they've got a lot of different guys that can hurt you." Jared Dudley weighed in with an important 13-point came off the bench to keep Brooklyn in front during a nailbiting finale. The Lakers meanwhile looked to James to keep them in the contest. James finished with 36 points but was unable to drag the Lakers over the line, despite a spirited rally late in the fourth quarter when they ran up 10 unanswered points to get within three of Brooklyn. James also had a double-double with 13 rebounds and eight assists in the losing effort. Lonzo Ball finished with 23 points and Kyle Kuzma had 22 points. The Lakers dropped to 18-13 after the loss and remain in fourth spot in the Western Conference. Elsewhere on Tuesday, Cleveland bagged only their eighth win of a miserable season after Larry Nance Jr. tipped in a game-winner at the buzzer to give the Cavaliers an upset 92-91 win over the Indiana Pacers. The Pacers, third in the Eastern Conference, struggled to get going with Bojan Bogdanovic their top-scoring starter with 14 points. Domantas Sabonis had 17 points off the bench for Indiana. Rodney Hood led the scoring with 17 points for the Cavs, last season's beaten NBA Finalists who have struggled to adapt to life after LeBron James. In Atlanta, 20 points from John Collins helped the Hawks to a 118-110 win over the Washington Wizards. The Hawks (7-23) had seven players make double figures while the Wizards' Bradley Beal delivered 29 points in a losing effort. In Denver meanwhile, the Nuggets maintained their lead at the top of the Western Conference with a battling 126-118 win over the Dallas Mavericks. Serbian star Nikola Jokic was once again the key figure for Denver, pouring on 32 points while hauling down 16 rebounds in a commanding display. Jamal Murray added 22 points for Denver on a night when seven players made double-digit contributions. Denver lead the West with 21 wins and nine defeats. Harrison Barnes led the Mavericks scoring with 30 points while Slovenian teenager Luka Doncic impressed once again with 23 points and 12 assists.